Each Year a New Beginning. 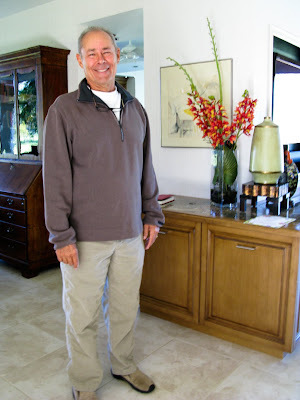 This morning as I was comfortably seated in my bedroom, on my mother’s recovered bedroom chair and ottoman, while writing morning pages, when I caught sight of Ray in the bathroom, putting the finishing touches on getting dressed and ready for his day of golf. I took a double take. Ray looked different: in his posture, attitude, choice of clothing and body profile. Wow. It is clear Ray is losing weight. He says he can’t see it. But I can. Ray and I have not eaten sugar or wheat product for 27 days. We have followed the HOW Food Plan where we write down all the allowed food we will eat for the day. We eat 3 meals a day (and two small 2oz protein snacks), email the listed food to a woman, and call 2 other women and ask how they are doing with their food. Oh, and we can’t weigh ourselves for 30 days! Not weighing has been the hardest part of this program for me. I have always let the numbers on the scale define me. And of course I am never happy with the numbers on the scale. I’ve never felt so emotionally in balance, gotten more intentions accomplished, and continued working on things, without getting mad, even when I don’t understand them right away. I feel kinder to others AND myself, more patient, more tolerant and more understanding. That’s all I’ve ever wanted. Hmmmmm. Eat sweets and bread? Or live in peace and comfort? Well, for today, I know what I’m eating, and sweets and bread are not listed on today’s food plan for the day. 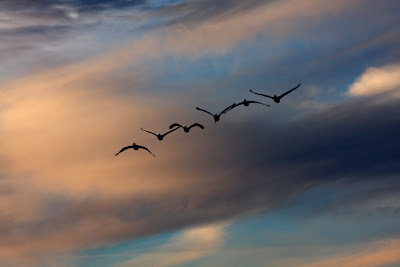 Each day a new beginning, each year a new beginning. I’ve got my list of updated 2008 Ideals and I’ve completed my 2009 Ideals for the New Year. Guidelines for Creating an annual Ideals’ List for the New Year. ~Every year since 1995 I’ve made a list at the end of each year for the upcoming year. This list contains, not resolutions, but ideals/desires of things I want to do, changes I want to make, principles I want to practice, etc. Throughout the current year I look at this list. At year’s end, I review how many listed desires I took action on. Looking back over the last 13 years since I started making these annual ideal lists, I found a pattern. I am now consistently accomplishing things I’ve always intended to do but never did. There’s no right or wrong way to do write an Ideal’s List, but I do have some suggestions. These are the thoughts that have made this tool particularly helpful for me. • Review all areas of your life in considering what to include: Home, Work, Vacation, Family, Body, Spirit, Mind, Service, Attitude, Sleep, Driving. • Dream big. You are not a failure if all the items on your list don’t get manifested in the coming year. I often have items that roll from year to year. Remember: learning about ourselves, rather than doing something perfectly, is what’s most important. • Be realistic. This is where you get to examine the balance between reality and fantasy. • Use verbs. Start each statement with an active verb, like choose, find, explore… For example, rather than “I want to go to Peru,” say “Travel to Peru.” The bulleted examples that follow provide other examples. I have found that including the following topic headings (components) in my annual Ideals list very helpful: Projects, Changes, Goals, and Desires. Some components have several parts. Sometimes a particular item may seem like it could be in one or more components. Trust your instinct or check with someone else. Don’t let confusion slow you down. I personally place a high value on learning, and I encourage you to begin at least one line of each major component (Projects, Changes, Goals, & Desires) with the verb Learn… For example: Learn to be more forgiving, Learn to type, Learn what foods are bad for me. A project has more than one task/action. Anything that can be broken down into smaller tasks/actions can be made a project. It takes some time and effort to get a project done. If you are having trouble with a particular task/action, like writing a letter, consider making it a project, and then break it down into more manageable tasks. Creating a clear list of changes you’d like to make can remind you of what changes (in behavior, attitude, body, mind, spirit or whatever) you want to be working toward. Sometimes changes can be a modification of existing patterns or something entirely new. • Define the number of sponsees I am willing to sponsor. Goals help you become the person you have always wanted to be. Be clear. The more specific your goals are, the more likely you are of having a goal be met. Setting and meeting a goal is something you will feel good about for a long time, maybe even the rest of your life. Some goals should be small and some large. Goals should feel a little harder than Projects. I encourage you to include one goal that you KNOW you will meet and one that you know you are capable of but probably will not achieve in the next year. Desires are a mix of what you want and what you know you should want. In naming desires, we list what changes we know we should make, but have been resistant to making. Naming desires is also the place where we identify what we would choose to make our lives fuller and more pleasurable. The purpose of listing what we should be doing for our own good, yet we don’t quite get around to is that we have a written reminder to help keep us on track. These guidelines are here to help write about our intentions for the coming year. I encourage you to use the topic headings/components if they work for you. If you choose to leave one out, add a different one. If you’d rather choose your own, feel free. Concept IX p. 40 – “Now we come to the all-important attribute of vision. Vision is, I think, the ability to make good estimates both for the immediate and for the more distant future. Some might feel this sort of striving to be a sort of heresy, because we ___s are telling ourselves, “One day at a time.” But that valuable principle really refers to our mental and emotional lives and means chiefly that we are not foolishly to repine over the past nor wishfully to day-dream about the future. As individuals and as a fellowship, we shall surely suffer if we cast the whole job of planning for tomorrow onto a fatuous idea of Providence. God’s real Providence has endowed us human beings with a considerable capacity for foresight, and He evidently expects us to use it. Therefore we must distinguish between wishful fantasy about a happy tomorrow and the present use of our powers of thoughtful estimate. This can spell the difference between future progress and unforeseen woe. Our Saturday MHCC hiking group. left side of group photo, rear to front: Roberta, Sandy, Karen and Carol. right side of photo, rear to front: Frank, Ernie and Linda. center of photo, rear to front: Ellen and Peggy. We had fun. I was thrilled to see 8 hikers show up this morning. That made 9 of us on the Shannon Trail Loop hike. We deviated somewhat from the scheduled Shannon Trail Loop hike after the first two miles and hiked east toward Mt Murray before circling back north and northwest to return on the Araby trail by Bob Hope’s house. We figure we hiked about 7 miles in the 3 and a half hours we were out there. We were a very flexible group. Everyone was up for anything and everything suggested. Watching everyone chatting with each other made the hike for me. I don’t know what it is but I enjoy getting people together and seeing everyone have fun. As I said, We had fun. 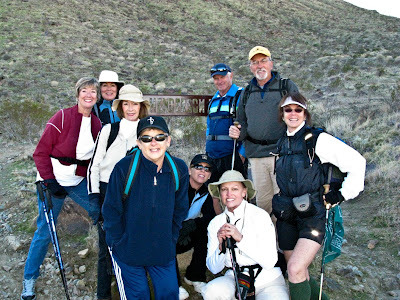 Come on out and hike with us Mission Hills CC Hiking Group members! Maybe watching the video will entice you to join us next Saturday. Hike to be determined, but you may count on there being a hike next Saturday, January 3rd! Look for an email. Happy Holidays to me from Susan L. and now, to you all. 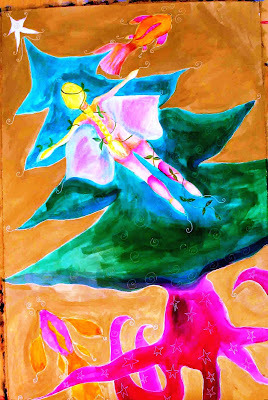 I asked Susan L. if I could post her pictured Xmas card art for my Xmas day blog. I also asked if she’d fill me in on what inspired her thinking while painting her beautiful Christmas card. As far as placement is concerned, I just wanted the character to be flying and for the tree and the fish to be free as well. The actual background is gold and yellow (like gold leaf or metallic) I chose that color of background because it’s association with the divine and yellow being wisdom. The tree represents growth, yet knowledge beyond human years. The fish is a symbol of simplicity and considered to be the perfect creature – adapting to its environment, yet swimming in water which represents consciousness. The tree is not rooted. It is flexible and adaptable. Blue represents the throat chakra – expression; pink the heart chakra (as does green), green also represents growth, health, prosperity. The little “tendrils” represent life energy and how we are all connected to all things. In most of my work I make the tendrils of gold or silver – once again representing divinity. These characters are all very playful with a multiple level message that is usually read simply by an attraction to color. Each color, each chakra, each tone (in sound/music) are representative of something in the realm of the divine. Usually all of these things are within the cosmic collective consciousness. I took myself out on a date today. I packed up all my camera equipment, tripod and camera. 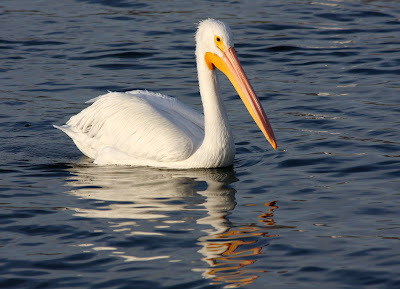 I used a 70 -300 mm lens and shot photos of the migratory birds at the Salton Sea. I’m doing the Artist’s Way by Julia Cameron and in Week 5 of the 12 week book I’m finally taking the time to go on the required weekly Artist date. I had a ball all by myself. It’s funny how I had to talk myself into doing this too. I wasn’t in the mood. I’ve posted a couple photos (I took over 300). I’ve also uploaded two videos from today. I hope I remember this the next time I feel too lazy to take myself out on an Artist’s Date. I really never want to do anything, especially in the afternoon or night. But, invariably, when I do what I don’t think I want to do, I have a great time. So….I don’t need to be listening to my head anymore. 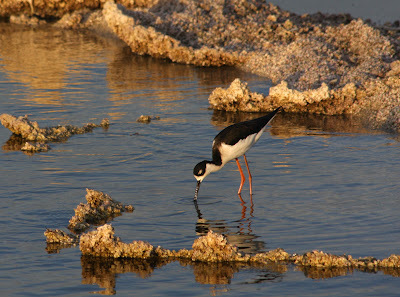 Check out the Salton Sea in the videos below. Mission Hills CC Hiking Group’s second hike of the season this morning. We hiked the Eisenhower loop at the Living Desert. There were four of us who braved what we thought would be a very cold 7:30am morning hike here in sunny Palm Desert: Linda, my friend Heidi, Sandra and Ellen. This was the first time Sandra and Ellen joined us on one of our hikes. I’ve said this before, but MHCC Hiking Group has the neatest members. Surprisingly, the only time I felt a bit cold was at the WAMU parking lot before we headed out to the Living Desert in Palm Desert to hike the 5.5 mile Eisenhower loop trail. The first mile of the hike is level. Once we started to climb everyone began shedding the many layers we were wearing. (After last week’s cold hike, we made sure we were dressed properly.) We skipped taking a break at the shady picnic area at the top of our 1.8 mile ascent, as the sun was still down behind Eisenhower Peak. Not stopping for a break didn’t keep me from eating my snack of walnuts and raisins while descending the next 1.7 miles. No siree! I don’t need to be seated to eat. The last 750 yards, before reaching the level desert wash, took us through a rocky and sandy canyon! Oh, and today was the first time I ever saw pooled water on the canyon portion of the hike. Below are two videos that I hope will inspire and motivate all you MHCC hiking group members to join us on our Saturday hikes. And don’t forget Bonnie’s Wednesday hikes. After the first flat mile, you’ll see us hiking up the 1.8 miles before descending on the return loop. It was a nice after-hike treat to view the sheep. The Bighorn Sheep aren’t always visible in their fenced in mountain home at the Living Desert. Take a look and pay attention to the last part of the video. To see still more photos from our hike, go to http://flickr.com/photos/gottagolinda/. By the way, Bonnie’s rained out hike last Wednesday is now rescheduled for January 14th. Bonnie will be sending out email notification I’m sure. 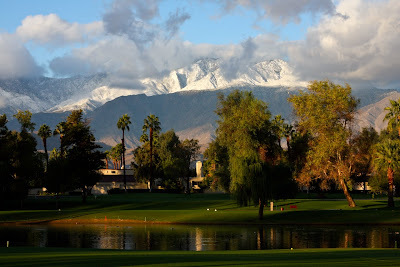 First BIG snow on San Jacinto. 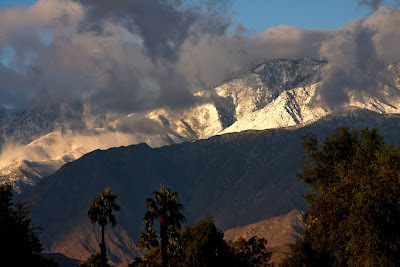 All day yesterday, I wondered how San Jacinto would look when the clouds lifted after the big one day storm. I woke and ran outside with my tripod and camera at 6:45am. Snow was down to the 2000 foot level. Might have to head on up in the snow next week for some close up snow photos. If you’ve clicked on the photo to get the full impact, use the back arrow to return to blog. Woohoo! Stat counter hits 10,000 views. I started this blog September 23, 2007. Today the stat counter reads 10,000 hits. I must say I am surprised and delighted that you would find what I choose to blog interesting enough to come back and follow along on a consistent basis. Thank you. I’m sure many of you have no idea about the fear I’ve always had of others reading my writing. The first time I ever had the courage to allow my writing to be viewed online was when I hiked the PCT in 2002. I hand wrote daily trail journal notes every night. In towns I mailed off the notes to my sponsor Debbie, who typed up and posted them to a website I started just for the hike. I was terrified everyone would find out I was a terrible writer. My motive for writing and posting these online trail journals was twofold: First, to keep all my friends and family apprised of my whereabouts and happenings. Second, to help future hikers like previous online backpacker’s journals had helped me. I was ok after a while knowing others were reading my journal entries because this writing was for a purpose while hiking. I first started keeping another online blog, not this one, (just for fun – i.e. – for no purpose) It was December 11, 2004 when I started this secret online blog. No one knew about it. The blog was for my eyes only. I still had way too much fear of what others might think to allow anyone to read my thoughts on the page. 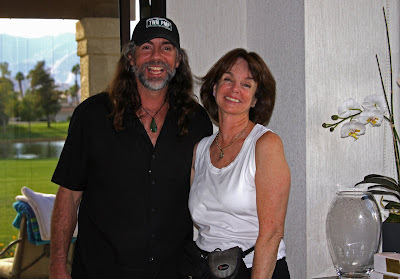 Then on September 23, 2007 I started this current blog you are reading. Recently went online and took a peak at that old private online journal, the journal I kept before this current blog. I found the last entry I wrote on that site before I changed over to this public blog journal. I‘m almost 20 years in my program. The 2nd step suggests I come to believe in a Power greater than myself. This next year I have high hopes I will experience physic changes as the result of possibly seeing some pretty ugly embarrassing things about myself. I’m hoping I’m on my way to finding and relying on a Power greater than myself. Then, I do want to try and live according to how this Power wants me to live. I’m tired. Tired of trying harder. I want to learn to relax, learn to enjoy my life, not try harder to be better, do more-All so you will think I have value. I’m done trying to make you see me a certain way so I will feel accepted or feel I have worth…….. So I’ll feel ok with myself and you. This over dependence on what you think of me is exhausting and it’s none of my business. I have to keep raising the bar in what I do to impress you. Here’s my pledge: from now on – what I think of me is all I’ll care about……. From today on and forever. Fun. That’s my ideal for living. To learn to have fun and relax. What do I want, what do I think, how do I feel? I’m so done thinking about how I come off to you on a daily basis so I’ll feel ok. Done. Well, something has happened since this writing in the private journal entry in 2007. I do feel freer. Less self conscious. Believe I deserve. Know what’s good about me. Worry more about what I think. And………I believe a lot of this change I feel in myself is the result of doing what I’m afraid to do, like writing in this daily blog. One day at a time, I’ve written. I‘ve posted my photography work. I have no secrets. You see it all on the page. I’m not hiding anymore and the sky hasn’t fallen. Actually, I’ve never had more self esteem and less fear. Who’d have thought change would come as the result of doing the things I fear. Thank you readers. Thank you so much for your kind words, continued support, compliments and fun comments. p.s. During my morning walk, wearing 2 layers of fleece and full rain gear in this atypical strong rain we are having, I took the photo above. Look at the view of our condo from the other side of the lake in the photo. What a great place we live in. 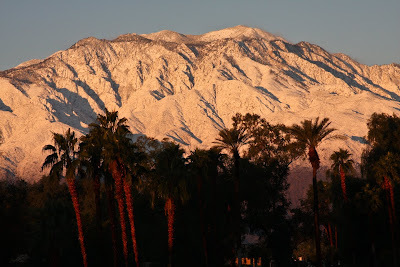 Snow on San Jacinto down to 4,000 feet. Yesterday, after a lot of rain the day before, I woke to this vision. And here is the full monty view from our home. The faces of San Jacinto. I think there has to be a book to be made some day of all the moods this incredible mountain projects. Or, better yet, all the moods this mountain creates in me. Me and my son Lane. This photo was taken Thanksgiving. Lane is the real photographer in the family. Why do I love this photo? Because my son is smiling in the photo. Lane doesn’t particularly like his photo being taken in a posed shot. But for me, he posed and I’m loving this shot as much as I love him. Intimidating storm clouds prevented ALL of the Mission Hills CC Hiking Group hikers from hiking today. We knew it was supposed to be in the 50’s at the start of the hike. 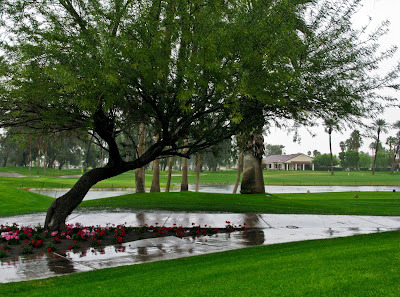 But gale force winds, black clouds and potential rain here in the desert foothills? When six of us showed up at our meeting place at Bob Hope and Gerald Ford at 7:30am this morning, none of us expected the quick weather change we experienced during the 20 minute drive to the Art Smith Trailhead. The six of us drove to the trailhead in two cars. After parking my car at the Art Smith trailhead, I climbed up a small embankment looking to see if Ernie and Carol’s car was approaching. I was nearly blown over from the 40+ mile an hour gusting winds. Peggy, Carol, Ernie, another Carol, Heidi and I stood outside our cars, fighting the wind while discussing whether we’d venture up into the San Jacinto foothills with the rapidly growing storm clouds darkening more and more of the sky. Some of our group didn’t have rain jackets. The temperature in the car had read 49 degrees. With the high winds and most likely rain, I didn’t feel comfortable with hikers heading out without rain jackets. So sadly but smartly, Peggy, Carol and Carol decided not to go on the hike. Heidi, Ernie and I actually had a great time leaning into the wind and kind of excitedly looking forward to what the weather was going to do. The black clouds coming in from the West over the top of the San Jacinto Mountains seemed to indicate we very likely would be drenched with rain. Hiking the steep trail kept us warm as we climbed all the way to our rest stop about 1 hour and 40 minutes after we started. The rain didn’t come. During our 20 minute break in a gully, the winds stopped. We retraced our steps and descended the trail as the sky filled with even more black storm clouds. But all we ever felt was an occasional drop of rain and no more wind. The sun was out on the valley floor, and we started taking off some of our warm clothing as we talked and enjoyed the remainder of our hike. I felt sad the others hadn’t been on the hike. A quick video of the noisy wind and black clouds as we hiked.